Home » A Thursday Thriller! Second Session is just flying by and we’ve had some very exciting days here at Manitou that I want to tell you about! Yesterday was a thrilling Thursday, as always, that was filled with fun and sun! For those readers who are new this session, our Thursdays are a special day at camp where we have a sleep-in, great food, and all sorts of fun cabin games, instead of our usual activity schedules. We started off the day with Chef William’s classic buffet which is packed with EVERYTHING, and after I had my chocolate croissant, I went on down to Main Field, where our weekly Hobby Hubs (activities for campers who don’t sleep in) were running. I was so excited to find out it was Kite Day, and some campers and I could decorate and build our own kites, and then fly them up to the highest heights! I was very impressed by some of our very skilled kite-flyers, but I think we all had fun in the end! It was then time for our Super-Duper Clea nup, where cabins tidy up the best that they can, in the hopes that they can win their unit’s prize–an ice cream party! And sometimes a cabin is just the cleanest one in camp, that they get a fancy steak dinner…what a treat! After cleanup was done, our Freshkid and Sophomore Units journeyed out of camp to go on Beach Day. It’s a great way for our campers to get a little time out of camp, and to have a fantastic time playing in the sand and the water. For our Junior and Senior Units left at camp, their counsellors had planned them incredible cabin activities, that ranged from everything like Blindfolded Olympics to Paint Fights. Everyone seemed to be having a great time, and it was a great feeling to see everyone bonding with their cabins. Later in the evening, everyone had their Evening Programs with their units, as usual, and I was really blown away by the Junior E.P., where they ran a huge relay race that had every camper and staff involved, and had people cheering at their tops of their lungs! And today we have our first Intercamp of Second Session, where we will be battling it out against Camp Tamakwa. 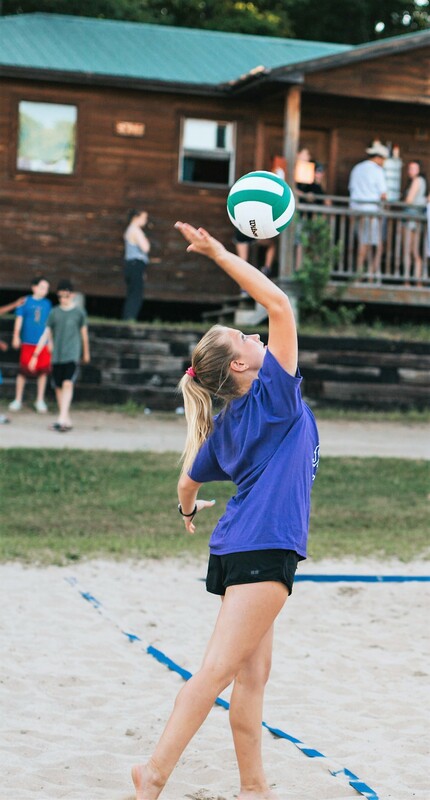 Our Intercamp team will be competing in Volleyball, Hockey, Soccer, Softball, Basketball, Archery, and Swim, and I know all of our athletes will be great! I hope we get a few wins today, but it’s the fun and sportsmanship that really count in the end.